I haven’t painted a sailing boat for two weeks! Yes, I said I was not going to paint sailing boats for a while and this is so far true. I cannot resist the sea though, I could never stop painting the ocean, I love it too much. This watercolour is painted on Arches rough paper and is 70 x 24 cm. Click the image below to see the full sized image. Author meldrumPosted on 2018/10/12 Categories David Meldrum, WatercolourTags akvarell, alone, aquarelle, ocean, peace, sea, solitude, watercolor, Watercolour2 Comments on I haven’t painted a sailing boat for two weeks! I am an artist now! Yes, I am looking forward to 2018. I don’t think I’ve ever been this excited about the start of a new calendar year. The 31st of December at the stroke of midnight I become a full time artist! I am a little nervous about it but it is nothing compared to the exhilaration I feel, the passion I have for my new career as an artist. I came up with a 5-year plan exactly 5 years ago. 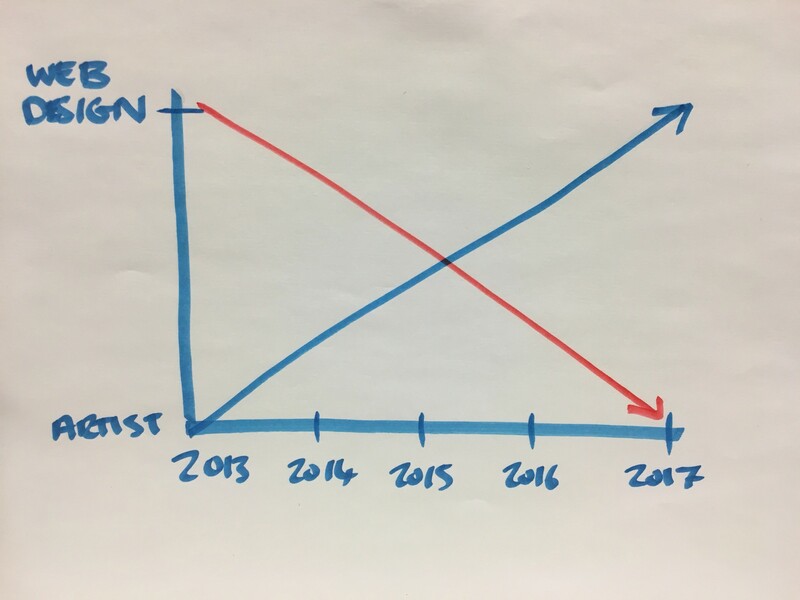 The plan was simple as you can see on my amazing slick graph, my art career was to grow and my web designer career was to decline. To my surprise it has come true and was totally on schedule, amazing! My plan for 2018 is to start a company and paint like crazy for the first 3 months. I will be developing “Meldrum Kroki” my life drawing sessions that I started back in October. I will also try my hand at producing weekly video vlogs plus painting tutorials or demonstrations. I think that’s enough to keep my self busy. It’s going to be a fun year in 2018, really looking forward to it.